Prepare cake batter as directed on package; pour into 9-inch springform pan sprayed with cooking spray. Bake 25 to 30 min. or until toothpick inserted in center comes out clean. Cool. Beat cream cheese, sugar and vanilla in large bowl with mixer until well blended. Add sour cream; mix well. Add eggs, 1 at a time, mixing on low speed after each just until blended. Pour over cake layer in pan. Bake 40 to 45 min. or until center is almost set. Run knife around rim of pan to loosen cake; cool before removing rim of pan. Microwave COOL WHIP and chocolate in microwaveable bowl on HIGH 1 to 1-1/2 min. or until chocolate is completely melted and mixture is blended, stirring after each minute. Cool 15 min. ; slowly pour over cheesecake. Refrigerate 4 hours. Sweets can add enjoyment to a balanced diet, but remember to keep tabs on portions. 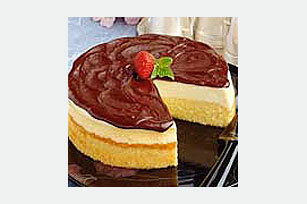 If baking cheesecake in dark nonstick 9-inch springform pan, reduce oven temperature to 300ºF. Place completely unwrapped packages of cream cheese in small microwaveable bowl. Microwave on HIGH 30 sec. or until slightly softened.